Explore the beautiful Berkshire town of Windsor at your own pace with this quick and convenient day trip by rail from London’s Paddington Station. Windsor has everything you need for a lovely day out of the capital – rich Royal history, pretty countryside walks and a quaint town centre. It has long been one of the most important towns in Britain’s royal history and is home to the magnificent Windsor Castle – official residence of Queen Elizabeth II! Arrive at Paddington Station at 8.50am, where you’ll meet a Golden Tours representative at the Information Desk (located at Platform 2), and receive a welcome pack with all you’ll need for the day. 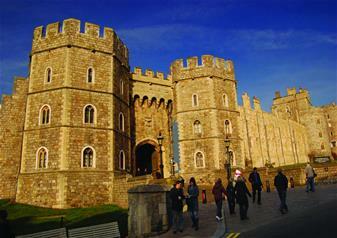 The train departs at 9.21am, so sit back in your reserved seat and relax as you zoom to Windsor. Find out why this glorious castle is Her Majesty’s favourite weekend residence and explore the sprawling grounds on this relaxing visit, taken at your own pace. See the lavish State Apartments, with artwork by Leonardo Da Vinci and Rembrandt hanging on the walls, the intricacy of Queen Mary’s Dolls’ House and visit St George’s Chapel, the final resting place of Henry VIII, Queen Mary and Queen Elizabeth the Queen Mother.